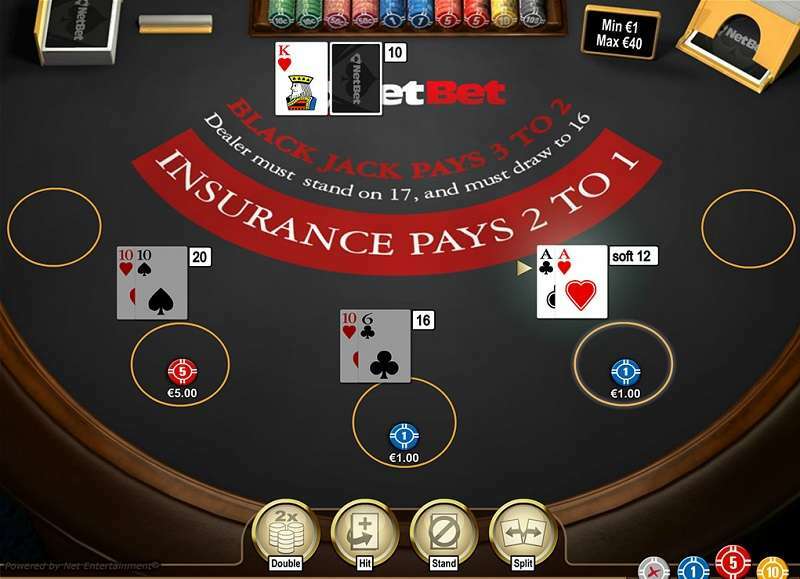 Netbet casino is a familiar brand to UK gamblers. It is one of the oldest online casinos around and one of the first that has received the United Kingdom Gambling Commission license. Serving for more than 15 years, Netbet casino has earned the trust of online gamblers from all over the world. So, is this the right casino for you? How about its bonus promotions, are they really advantageous? In this Netbet review, we are going to answer these questions and evaluate this casino in detail. The NetBet casino was opened in 2001. Since then, it has been operated by Mandaplay Limited and Cosmo Gaming Company. When it first opened, its name was “Casino 770” and most British players still remember it with that name. Mandaplay & Cosmo Gaming is a small-scale group and currently, they have no casinos except NetBet. In the past, they had another brand called “Riva Casino” but this website has recently closed down. Netbet is currently the only casino in the group. We can say that Netbet site uses a little archaic design. Compared to modern casino designs, it looks quite quaint. The design is predominantly black, with no other colours. Despite the fact that the design looks old, we can say that there is no navigation problem. The strip at the top of every page contains links to the most visited pages. It is possible to directly reach the categories of games and bonuses from the main page. In short, the design is extremely convenient, and even those who visit the site for the first time will have no difficulty in what they need to do. In this context, let’s say that page loading speeds are above the average. Each page is fully loaded in just a few seconds and there are no performance issues. Netbet is a double licensed casino. It has both the Alderney government and UKGC licenses. Thanks to the UKGC license, it is able to serve the UK and the majority of other European countries. The Alderney license covers many other countries in the world. Both of these are highly prestigious licenses and contribute positively to the reliability of NetBet. In this context, NetBet site does not accept members from the following areas: the Bahamas, Belgium, Curaçao, Cyprus, Estonia, France, Hong Kong, Israel, Italy, Portugal, Singapore, Spain, Turkey, and the United States of America. NetBet also uses 128-bit SSL encryption provided by GoDaddy on every page. You can view the website in multiple languages, but it automatically detects where you’re connected from and determines which language will be shown based on your geographical location. So you cannot switch between language options. Supported currencies are GBP, EUR, and Bitcoin. In this context, it should be mentioned that NetBet is one of the few online casinos that support cryptocurrencies. Especially providing BTC support which is not a very common situation among UKGC licensed casinos. NetBet offers a native mobile app for mobile gamblers using the Android platform. You can download this application from the official Play Store. Some bonuses are available for mobile users too, but they are not listed on the site. Nevertheless, it is recommended using the mobile application even if you have not tried it before. You may be able to combine mobile bonuses with other promotions. However, the mobile application can only be used by players in the UK. Those living in other countries cannot benefit from this app. There is no separate application for the iOS operating system. But this is not bad news: Because the NetBet site is encoded with HTML5, it can be displayed seamlessly on all mobile devices’ browsers. Moreover, there is no loss of performance and features. Whichever device you have, open the browser and enter the Netbet casino address: The mobile version of the site will be automatically loaded. Using the mobile version you can play games, access customer service, make payments, and withdraw money. Moreover, this version offers a more modern and useful design. Sports Betting: This is a highly advanced service and it has surprisingly large coverage. You can bet for almost all of the European and American leagues. Even e-sports betting is supported. It can be said that the odds are slightly higher than the sector average. This service is offered via a separate address and uses a much more modern design. Casino: NetBet works with a total of 20 providers. These include well-known brands of the industry, such as Netent, Microgaming, IGT, Bally, and WMS. You can also find games from smaller providers such as iSoftBet, Leander Games, Ainsworth, Pragmatic Play, and Booming Games. It is possible to find about 1,000 games in total. Most of the collection consists of slot and jackpot However, table and card games (roulette, blackjack, baccarat, etc.) are also included. The game collection is extremely satisfying and you can be confident that you will find a suitable option, whatever your expectations are. Live Casino: There are 26 games in this category. 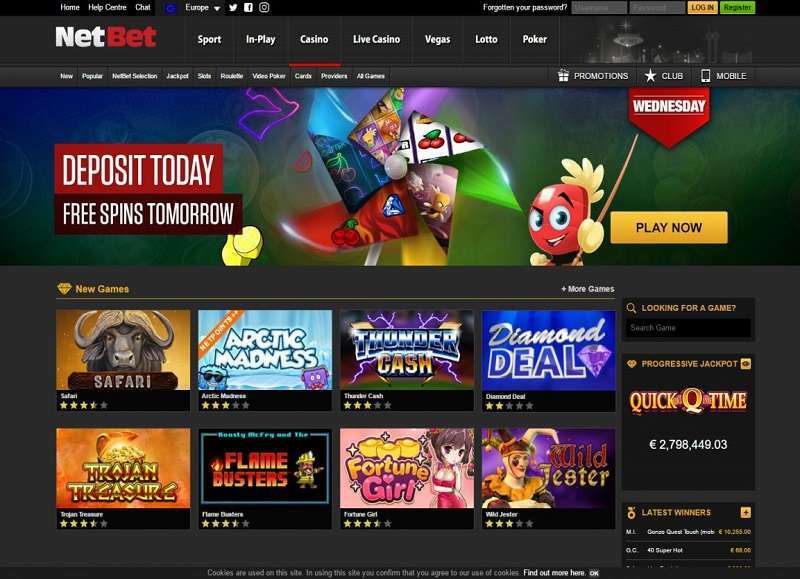 NetBet does not use a white label service and organizes live casino games by itself. So the dealers in these games only work for NetBet customers. It is possible to find a live game almost every hour of the day. Poker, roulette, baccarat, and blackjack options are offered. The dealers are very professional and speak multiple languages. Satisfactory broadcast quality can be achieved even on low-speed connections. Lottery: This service is only open to UK players. Multiple lottery games are offered. Poker: In addition to other poker games on the website, NetBet also has a separate poker network. Using the applications developed for Windows, iOS, and Android, you can connect to this network and participate in real money poker tournaments. During prime time, the number of online players exceeds 5,000. NetBet games are subject to regular fairness control by iTechLabs. So you can be sure that every game you play is fair. In this context, it is one of the rare casinos that reveales RTP rates publicly. This ratio is 96.63% and it is much higher than the industry average. So you can win back $ 96.63 of every $ 100 you invest in the long run. Games require no download and can be tried for free. 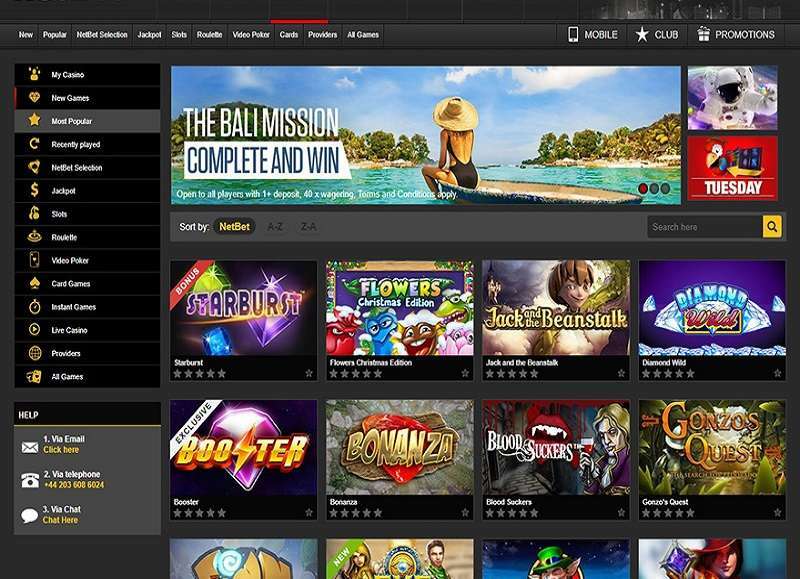 NetBet is not a “download” casino, all games support the instant play feature. This means you can play them through your browser without installing a separate software, such as Flash. The match rate of this bonus is 100%. Your deposit amount will be doubled. However, the upper limit of this offer is 200 EUR. You cannot win more than this amount. To benefit from the campaign, you must deposit at least 50 EUR. The free spins can be used on Age of Gods slot machine You should also use them in a week or they become unusable. To withdraw the bonus amount, you are required to complete a 30x turnover requirement first. In other words, you must wager 30 times the bonus amount on any game. Winnings from free spins are subject to another turnover requirement with a 50x rate. Reel Deal: This is a slot tournament that is held every week. After joining the tournament, you are asked to play 20 rounds minimum on selected games. The first 5 winners get additional free spins, between 5 and 50. Wednesday Free Spins: Depositing 10 EUR minimum on slot games on Wednesdays awards 10 free spins. These spins can be used only on 4 pre-selected slot machines. The bonus is subject to a 40x turnover requirement. Happy Hour Friday: If you use the bonus code HAPPYHOUR on Fridays while making a deposit, you get a 50% match bonus. The upper limit of this offer is 50 EUR. Same turnover requirement rate (40x) applies to this bonus too. Bet 5: This offer is available every Sunday. Every Sunday, NetBet picks a specific game and if you deposit minimum 5 EUR on that game, you win an additional 5 EUR. You cannot withdraw this amount but you can use it to play games. In case you make a profit with the bonus money, you must wager the amount 40 times first in order to withdraw. In addition to these, NetBet has a loyalty points system and a VIP club. Playing games and placing bets will give you points, which you can convert to real money after reaching a certain amount. It is worth mentioning that the customer service of NetBet has won many awards in terms of excellence and speed. RTP rates higher than the industry average. Also offers top-notch sports betting service. One of the oldest brands in the online gaming industry. More than 1.000 games, best titles of 20 providers in total. Provides its own live casino service. 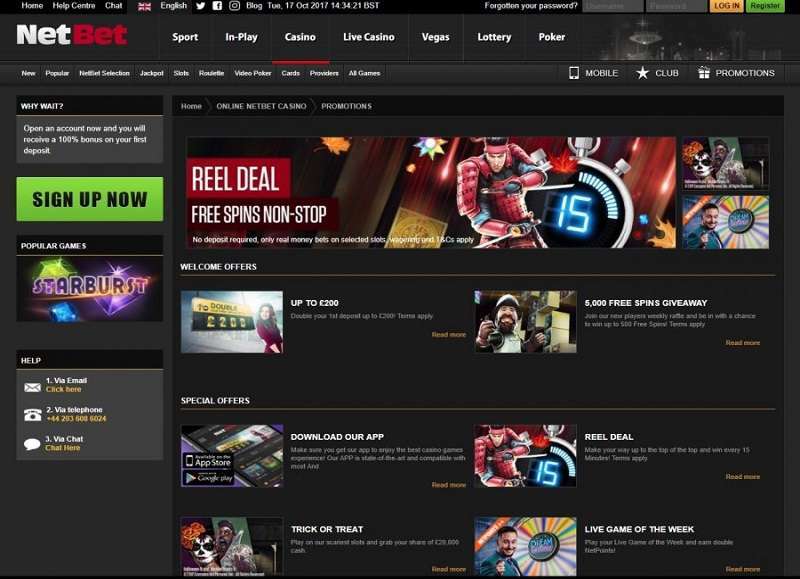 If you are a gambler from the UK, NetBet should be one of your first choices. Thanks to its double license, NetBet can accept members from nearly everywhere in the world too. NetBet provides a safe, fair and secure gambling environment that can appeal to every liking. It is one of our most recommended online casinos for this reason. I'm not from the UK, but I still like it. Agreed. The design IS rather DULL AND BORING. Wish they'd change something. I play roulette and blackjack from time to time. It's not that bad. I wish I could download NetBet casino on my phone though. Pity, it's only for players in the UK.